DENMARK STRIKER NICKLAS Bendtner has dropped his appeal against a 50-day prison sentence for assaulting a taxi driver, the state prosecutor of Copenhagen has announced. 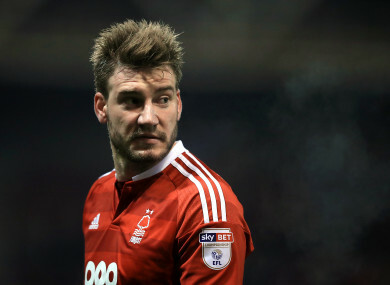 Bendtner was found guilty of the offence earlier this month with the victim reportedly suffering a broken jaw. The former Arsenal player claimed he was acting in self-defence. Nicklas does not agree with the decision of the court but decided to put the case behind him and focus on his club and his family,” his lawyer Anders Nemeth told Danish news agency Ritzau. His off-field behaviour has brought him trouble in the past. In 2013, while on loan at Juventus, he was slapped with a £97,200 (€110,708) fine and stripped of his driving licence for three years following a drink-driving charge. Email “Bendtner to serve 50-day prison sentence for assaulting taxi driver after dropping appeal”. Feedback on “Bendtner to serve 50-day prison sentence for assaulting taxi driver after dropping appeal”.